Some people are just born lucky. And most probably, they were born in April with one of the best birthstones of the bunch: the beloved diamond. The history of birthstones has deep ties with the breastplate of Aaron, a sacred object worn by the High Priest of the Israelites, as a method to communicate with God. It contained twelve gemstones–topaz was on the bottom (unverifiable fact). So birthstones have quite the lengthy history. As a matter of fact, the King James Version of the Bible contains a whopping 1,704 references to gemstones! So for a long time, those born in April have been showered with gifts studded with diamonds…while the poor saps in November were given yet another (yawn) topaz gift. Whatever your birthstone, we can find the high quality birthstone and create a custom design piece especially for you. Unfortunately, we don’t work with topaz (just kidding). Nothing tickles our fancy more than pale gems with just the slightest hint of color. There’s something so perfectly subtle about them, as if they barely whisper, the wisp of unspoken words or romantic thoughts blowing in a light breeze. Prasiolite is a green variety of quartz, a silicate mineral chemically silicon dioxide. Since 1950, almost all natural prasiolite has come from a small Brazilian mine though its also since been mined in Lower Silesia in Poland. Naturally occurring prasiolite has also been found in the Thunder Bay area of Canada. Green quartz is often incorrectly called green amethyst. It is against the Federal Trade Commission Guidelines to call prasiolite “green amethyst.” Other names for green quartz are vermarine, greened amethyst or lime citrine. The word prasiolite literally means “scallion green-colored stone” and is derived from Greek. Cubic Zirconia has a bit of a bad rap. It’s often considered a cheap and obviously fake diamond alternative. But it has an interesting history and deserves props for being one of the many steps to smarter diamond alternatives today. In 1937, two German mineralogists made an important discovery in Cubic zirconia’s history. The scientists found that melted zirconium oxide contained cube-shaped crystals. While this was a unique characteristic to any mineral, the men didn’t understand it as being anything useful since the same properties also existed in the mineral’s natural state. That redundancy seemed inconsequential to both men, and so they simply ignored their find. As with all scientific discoveries, the honor of naming the object or process is given to the one(s) making the discovery. In this case, neither man even considered naming their find, so cubic zirconia retained its scientific name. The world continued to overlook the mineral and its potential for several more decades. It wasn’t until decades later that scientists”rediscovered” this simulated diamond, while searching for a less expensive material to be used with lasers and industrial applications–not for jewelry yet. Finally, in 1977, Russian scientists discovered how to grow these crystals using a synthetic process. 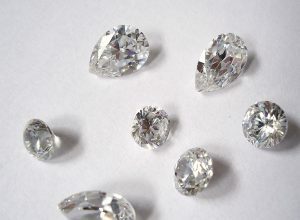 They named this synthetic crystal “Djevalite.” Under this name, they began to market them as simulated diamonds which took the jewelry world by storm at first. CZ possesses two traits that prevent it from having an identical appearance to diamonds: CZ has more sparkles in rainbow colors than diamonds and also has more fire. CZ is more brittle and softer than a diamond. Regardless, it gave consumers the opportunity to wear a lot more bling for their buck. Over the years, CZ has underwent some “bad press” because of its earlier cheap and often yellowish or greenish tints but, like other simulated diamonds, these synthetic gems have come a long way and seen substantial improvements in look and quality. Interestingly, many people have never seen the 1963 film Cleopatra but what they do remember: the way star Elizabeth Taylor wore. Her look was so powerful and distinctive, one could venture to guess that most people picture her character first when they think of the actual historical figure. Every piece for the film Cleopatra were created by Italian jewelry house Bulgari. And that means every piece: including the infamous snake bracelet, the coin necklace and a mirror of yellow gold with turquoise (which apparently Taylor kept after the film was wrapped. She often included jewelry gifts as a signing bonus. Smart woman). Snakes were a thematic motif for this film, so it’s no surprise it would have found its way into the design of the jewelry. The real Cleopatra wore snake-related accessories as well. Looking for a snake-related custom design piece? We’re happy to use iconic jewelry from Old Hollywood as an inspiration. Picture it. You’re at a swanky event, dressed in your finest. Your dancing to Michael Jackson’s Thriller (hey, its Halloween season) and the next thing you know, your pearl necklace breaks! The pearls spill all across the dance floor. Party goers begin slip sliding and not to the music. You rush to pick up every errant pearl but alas, you find most of them, but not all. Knotting. Or the lack thereof. That’s what went wrong. What Exactly Is Pearl Knotting? 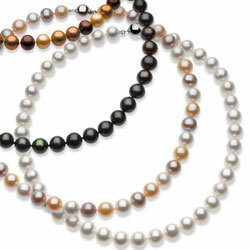 Pearl knotting is the act of tying knots between each pearl strung in a necklace or bracelet. These fine little knots make sure you only lose one pearl as opposed to an entire set. Freshwater Cultured Pearl Necklace, 10mm-11mm, 18″ long with a sterling silver clasp. The original brooches weren’t exactly adornment per se; they served more practical purposes, like securing clothes so they stay put. Early brooches were made of shell, bone, carved stone and wood. But brooches evolved, as did most kinds of jewelry. Craftspeople began using higher quality and more precious metals. By the 1400’s, brooches were embedded with gem stones. At this point, brooches served as method to show wealth and status and became less about practical purposes (like keeping your coat closed). By the 1940’s and 50’s, smaller “cocktail brooches” were often seen on the stylish lapel of its wearer. By the 70’s, brooches became more fun and reflected pop art of the time. Today, brooches bring a touch of sophistication and elegance to even the simplest of outfits. We’d love to custom design a brooch design from the heart. A wearable keepsake to pass down to generations. 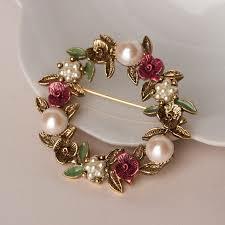 Vintage Brooch Faux Pearls and Enamel Flowers. Before you squeal too loudly, understand this: live insect jewelry has been around a long time! 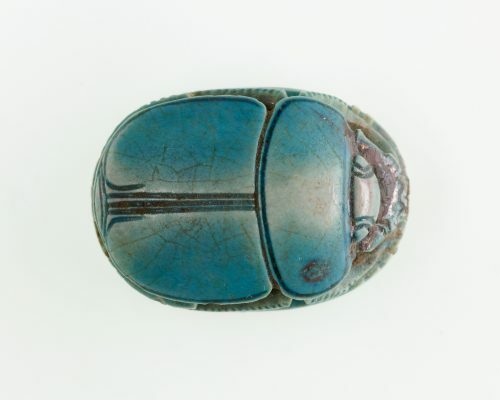 The Egyptians were one of the early adopters, wearing scarab beetles into battle. The Giant Madagascar Hissing Cockroach and the Mexican Maquech Beetle have also been used in jewelry. Even during the prim and proper Victorian era in Britain, jewelry lovers often sported large, vividly colored beetles attached to their clothing by tiny gold chains (and yes, these creepy crawlers were often live). So while you might pass on wearing a Giant Madagascar Hissing Cockroach to your next night out on the town, remember: you would have been the hit of the party just a few hundred years ago. Scarab of Hatnefer, ca. 1473 B.C. It stands to reason that when it comes to fashion, there’s a practical element. Humans wear clothing and jewelry not simply to look good but to stay warm and protected. In prehistoric times, jewelry was used as a form of protection and adornment. Later, jewelry came to reflect status. Jewelry were commonly created from the materials humans had at their disposal. If a tribe of people lived by the ocean, for example, one could surmise that shells, fishbones and colored pebbles would be used to create jewelry. Inland ornament material would include matter used from animals that had been killed for food, like antlers, tusks and animal bones. Regardless of the material, ancient jewelry provides us a keen insight into the era from which they came, not only the location but the type of humans imprinting their creativity, their expression and their stories. In general, there are six eras of antique jewelry. Each era has identifiable aspects that help define it and the culture that surrounded it. And as this video points out, each is more gorgeous than the last. Did you know that since 2006, veterans have been encouraged to wear their hard-earned medals on civilian clothing? “The Department of Veteran Affairs (VA) encourages all military veterans to wear their medals and decorations during Veterans Day, Memorial Day, Independence Day, and other patriotic holidays as well as formal occasions such as a parade honoring the military, retirement ceremonies, funerals, or weddings. “You can wear either the full-size or miniature-size medals. You should place the medals and decorations in approximately the same location and in the same manner as for the Army uniform, so they look similar to medals worn on the Army uniform. We like this more lax rule on medal wearing. People who have served our country deserve to display their service proudly and frequently. Remember: thank a veteran you know or meet. It doesn’t need to be Veteran’s Day!